1. In a small bowl mix the butter with the paprika until well combined. 2. 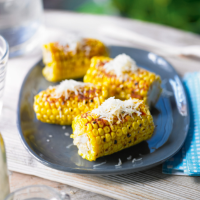 Cut the sweetcorn in half and place in a pan with boiling salted water and cook for about 6-10 minutes or until tender. Then drain the sweetcorn and transfer on to the barbecue. Turn while basting with the smoked paprika butter until a golden colour on all sides. 3. Sprinkle some of the Manchego cheese on top and allow to slightly melt. Remove from the barbecue and serve with a little of the paprika butter on top.